One of the most important reasons for businesses to use Instagram Stories is relevancy in their followers’ feeds. Having stories that appear at the top of your follower’s feed helps keep your brand at the top of their minds. If you gain enough influence on Instagram, stories can also appear at the top of the explore page, helping gain a wider reach. 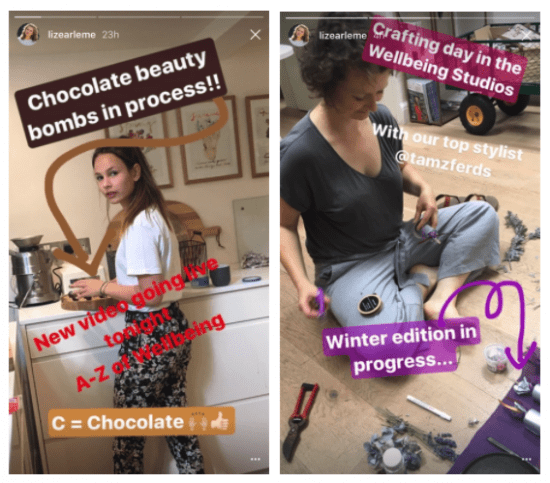 Firstly you might need to define which platform is best for your business Instagram stories or Snapchat? 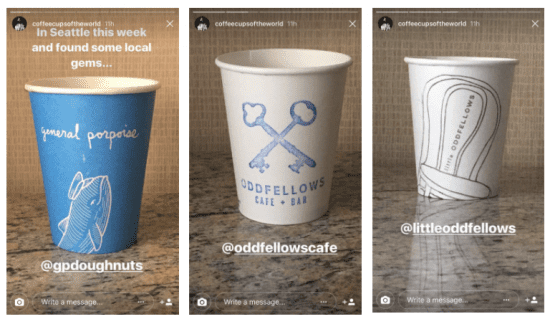 As Instagram’s features become very similar to Snapchat, it has become confusing for marketers to determine which platform is best to use for their business. Check out our blog post where we look at their differences and help you choose which platform is best for your business. Once you know what platform is best, you need to decide what approach to take and how it will fit into your social media strategy. 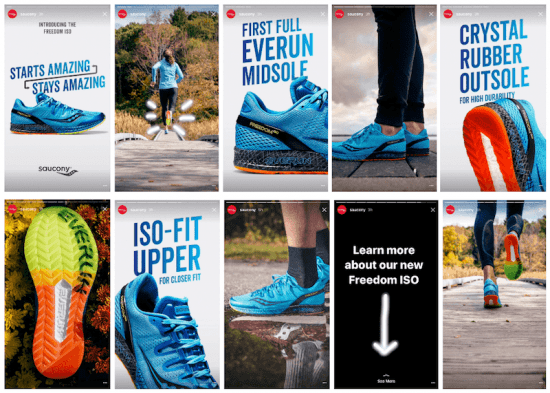 Use these six tactics and examples of brands using stories to help inform your own Instagram marketing strategy. For most brands, this is the most popular use of Instagram stories, allowing you to share more of your brand with followers. Giving users a sneak peek into your day will make them feel special, especially if you don’t share this content anywhere else. One way you can implement this is taking your followers behind the scenes of an event or in the office showing what a normal working day looks like. Try putting together a real story showing off your brand's key assets and skills of your employees. This is a quick and easy way of selling your brand. 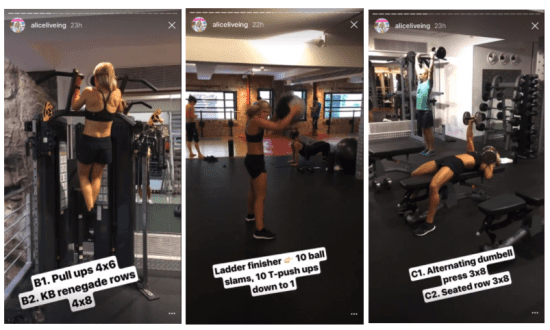 One fitness influencer, AliceLiveing uses Instagram stories to share her gym routine so her followers can join in and copy the routine. Liz Earl also shares behind the scenes shots of creative processes such as making products, editing her magazine and inspiration around the office. She often features photos or videos of her employees at work, giving followers an idea of the office culture and a glimpse into her everyday life. 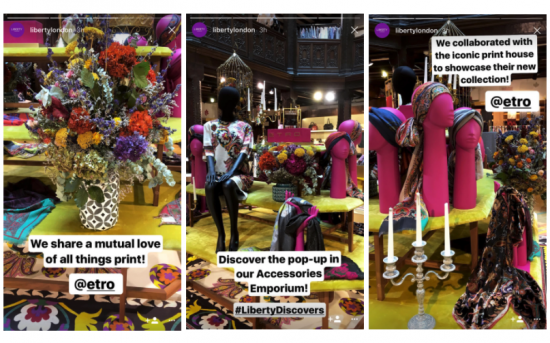 Liberty of London often shows the creative process of their window and in store displays, promoting and pushing new products. This is a great way for retailers to show off their new stock and season trends. Not sure you have anything interesting to feature? Think about your customers interests and what your company does on a day-to-day basis. Think about some of the fun aspects you could show them, such as socials, team meetings, brainstorming sessions or lunches out. 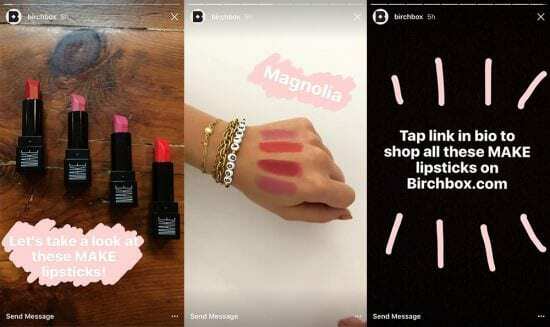 Many marketers were thrilled when Instagram rolled out adding links to stories for all users, not just brands and top influencers. Why? Because it's the only place on Instagram you can place a link to any single post on Instagram. This might lead to marketers and users adding one too many links too frequently. Making them less effective and annoying to your viewers. You want to lead them to only your best content and only when it's necessary, making sure it adds value and context for your viewers. 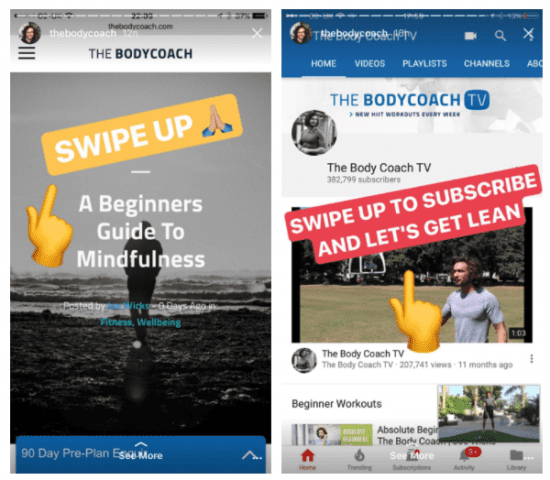 The Bodycoach, best known for this lean in 15 books and snappy Instagram video tutorials, using stories to push his products and redirect his customers to his website. Once they land on his website this holds all his product information and details of his diet plans. Vloggers and well-known influencers such as Marcus Butler and Pointless Blog use stories to push their YouTube videos and blog content. Updating their followers when new videos have been uploaded, making it easy for followers to swipe through. How can you redirect viewers? Your main aim will be to direct your viewers to your website or key content. Firstly identify where you want to take your followers and find a way of pushing that on stories. You can also send them to new product launches, to drive traffic to relevant landing pages. A great way to get users to your site is through sharing tutorials of your product or service. Try including a full description of the product on your website or landing page so you can link to your website at the end of the story. A number of companies have made excellent use of this tactic, Birchbox, a makeup subscription service are on of many. Featuring their monthly products, giving customers a sneak peek of what to expect. This is an effective sales tool, showing customers how your products perform in real time. Saucony used stories to launch their new range of running trainers. 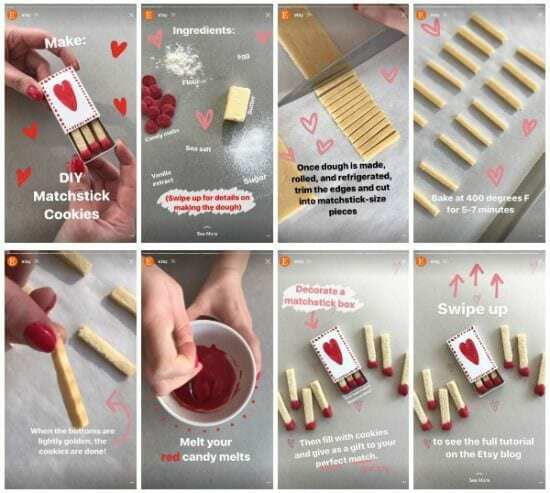 Each shot promoted its key features, showing the product in action and featured a link at the end of the story directing the viewer to the product and product description. Etsy often does 'How to' stories offering step-by-step instructions on creative projects. This is a great example of adding value for your customers and having fun with your social media. They don't show the full tutorial, giving the viewer a reason to swipe through to their website for full the instructions. What can your show your viewers? Do you have products you could demonstrate? or a service to promote? consider using stories to show off the best features of your products and give your followers an exclusive preview that they wouldn't find anywhere else. Offering something your viewers can't access anywhere else on other social media platforms gives them a reason to watch your stories and adds value for them. 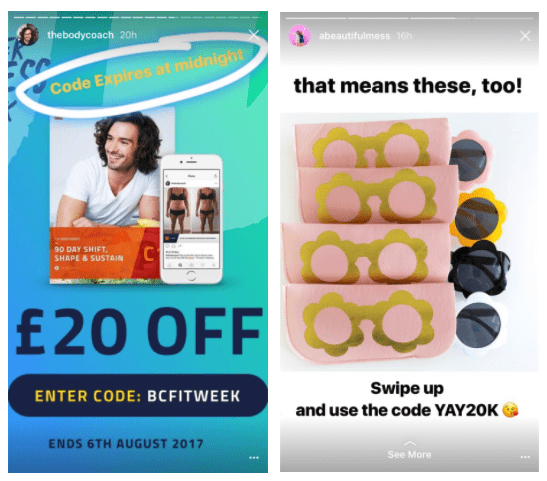 Using stories to promote your business’s special offers, you will give your followers and users a reason to watch your story, helping you deliver better results. You can do this through offering a discount code in the story or directing your viewers to a swipe up link. You can also direct them to a link in your bio which will take them to a landing page where they can learn how to redeem your offer. This will give your viewers a sense of urgency to act on the offer and could lead to an increase in sales. These two examples are using discount codes and swipe up commands to get the customers to their website. 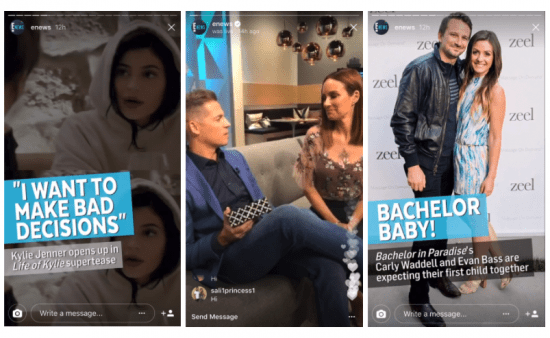 If you're launching a new product or have a notable announcement, using Instagram Stories reinforces the idea that people who watch your content are in-the-know. Try to get followers excited about your products and news. 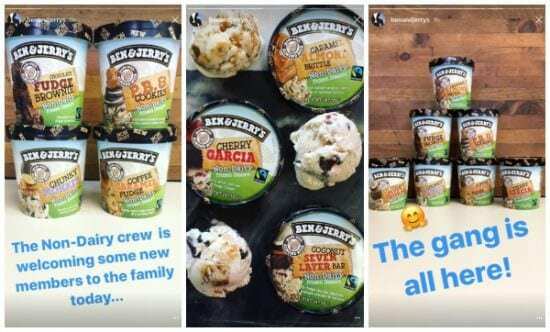 Ben and Jerrys chose Instagram Stories to announce their new dairy-free products. What announcements do you have to share? Think about any upcoming events you might be attending or new product launches you have planned and consider using Instagram stories as part of your campaign. Can you offer an exclusive discount to your viewers? 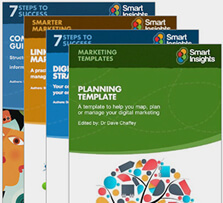 Why not trial an offer first and see how it performs before integrating it into your campaign. Showcasing your customers and their images or videos in your Instagram stories is a great tactic to make your customers feel valued and encourage others to share content and engage with your brand. One Instagram account CoffeeCupsoftheWorld use follower photo submissions as part of their Instagram story series. This is an easy way of using stories to generate engagement and encourage your followers to submit photos. Need Ideas? Consider sharing images of customers tagging your products or doing a Q&A. Your employees and customers can have a lot of interesting things to say, so make use of them. Consider a one-on-one interview or question panel of experts, discussing relevant topics to your business. Q&As are an easy way to provide interesting and valuable content for your followers. You may have noticed Live streaming is the next big thing for brands looking to tap into real time connection with their audience. If you’re going live and providing great content, more people are going to tune in. These videos often rotate as more viewers tune in, and live videos end. So by going live often, you’re giving yourself a chance to appear and gain more followers. Instagram Live gives businesses a way to deliver time-sensitive content to your fans and network. Use this feature give your fans a unique insight into who you are. 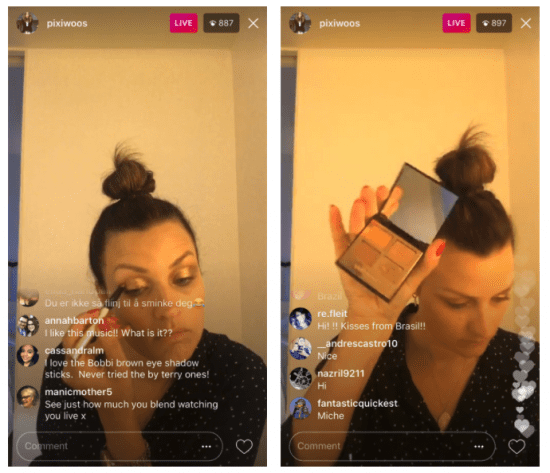 Pixiwoo, a YouTube makeup guru live streams her makeup routine, allowing fans to ask questions about the makeup she is using in the comments section. She gives fans unique access into her personal routine and daily life. E! News is a great example of using stories to feature live news. They create short photo summaries of recent news, allowing their followers to consume their content in a more visual manner. As well as live streaming behind the scenes of the show. How could your business use Instagram Live? Live video is a great way to answer questions from your audience in an engaging way. Why not invite your audience to interact with some of your team and to show the people behind your brand. Take them behind the scenes or use live video to launch a product or big announcement. You can let the world know about your big news and also interact with your audience at the same time. 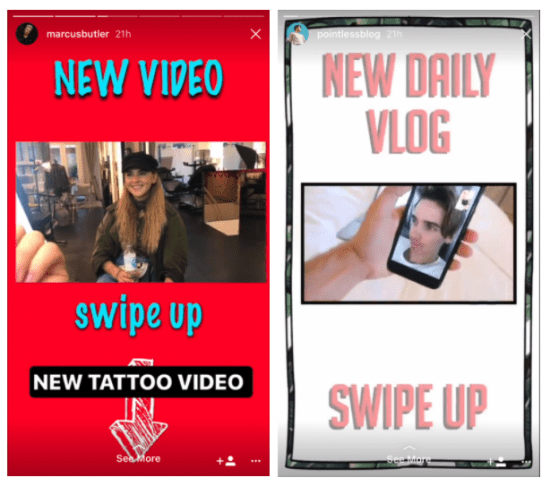 What do you think of Instagram stories? How you used it as part of your social strategy yet? And if you what worked well and what didn't work well? Let us know by tweeting us or commenting below. If you would like to find out more about using Instagram as part of your social strategy check out our Instagram marketing guide. Giving you practical steps and templates to Instagram success.